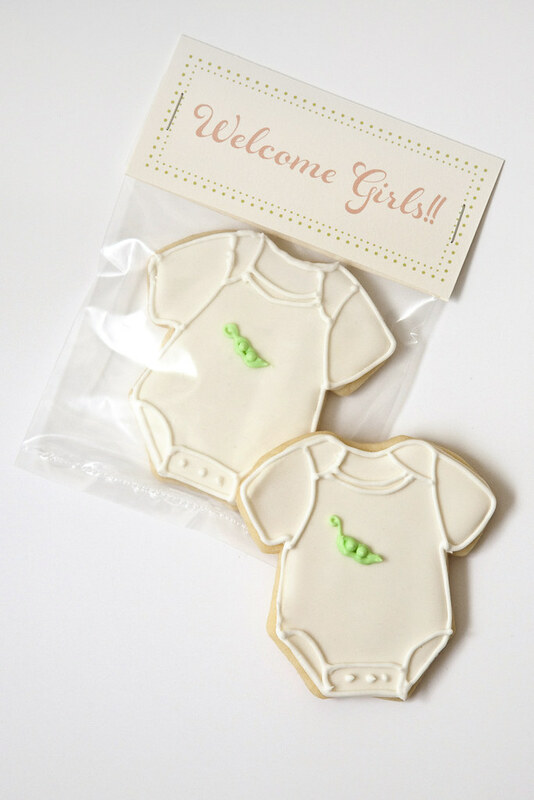 Baby Shower Cookie Favors for Twin Girls! I got to make baby shower cookie favors for someone expecting twin girls? Double the cuteness. I made 4 dozen onesie cookies - half the batch were decorated with two peas in a pod and the other half got a pair of cherries. The grandma of these twin girls who requested the cookies wanted the tags to read "Welcome Girls!!" so I designed a little tag using my newly purchased font that I love so much and a pink and green color palate reminiscent of a dreamy Serena & Lily nursery. I love how you can feel the genuine joy and enthusiasm for this pregnancy even in the cookie tags! I got a lovely email from Grandmom that reported the cookies arrived perfectly intact and the shower and cookies were thoroughly enjoyed by all!